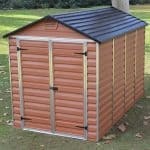 The 6 x 10 Palram Skylight Plastic Amber Shed is an attractive garden shed with a log cabin colouring and appearance. 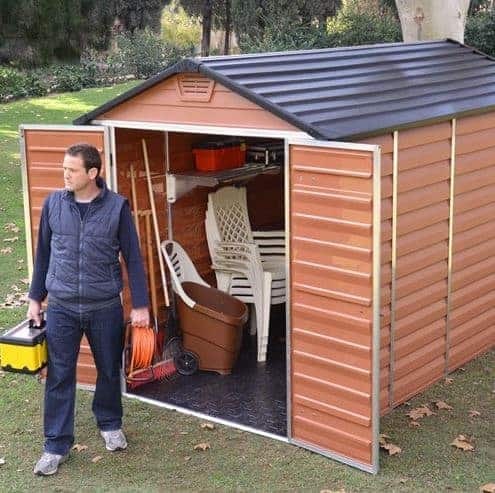 The shed has a fantastic 10ft depth, making sure that there is room for the average household’s outdoor and garden equipment. This wonderfully versatile plastic shed measures 6 x 10 in its dimensions. The shed also has a unique skylight feature, which brings in plenty of light, enhancing the practicality and the comfort of the building. Ventilation is available at each end of the shed, keeping the contents dry and safe. The building has a pleasing tongue and groove look on the outside, and there is a steel frame to bring durability. A 10 year anti-rust guarantee ensures that the steel frame is kept safe and secure. The skylight is created with polycarbonate and brings a durable feel. 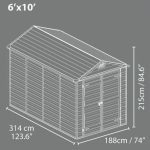 With the shed interior measuring at 6x10ft, fitting in all of your outdoor and garden equipment is easy. Freestanding shelving may be added for additional storage purposes, particularly for smaller items such as tools and accessories. The double doors provide easy accessibility, especially for any large items you may wish to store such as bikes or garden furniture. 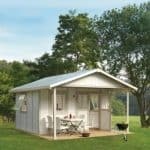 When looking for a garden shed to purchase for your garden, it is worthwhile considering the many options available to you. 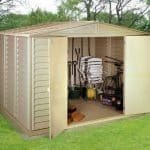 One of the major decisions, and the starting point for many potential purchasers, is whether to buy a metal, plastic or traditional wooden shed. As you will see with the Palram Skylight shed, there are many advantages to the plastic shed, as well as other fantastic features which we will discuss in further detail below. Exterior: The Skylight shed exterior is constructed from strong polycarbonate panels, supported by an aluminium and galvanised steel frame. The exterior overall is very durable, weather-proof and will protect you equipment from the elements. The skylight allows a lot of light into the shed without compromising security of the items inside. Interior: The 6x10ft shed interior is an excellent storage solution for those wishing to store small to medium sized items. An interior shelf may be purchased as an optional extra from Palram, which may be fixed directly to an interior wall. 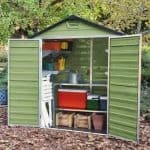 You may wish to consider installing freestanding additional freestanding shelving or storage into the shed to keep the contents organised. 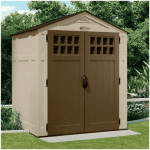 Doors: The double doors are a good size and almost the same width as the shed. Accessing your items is easy, as is being able to locate harder to spot items, as the doors provide a great overview of what is inside. Security: Although the Palram shed doesn’t come complete with security fittings, it does come with latches that offer the option of adding your own padlock to. Padlocks may be purchased independently at a modest price. 6 x 10 Palram Skylight Plastic Amber Shed: How easy to build? 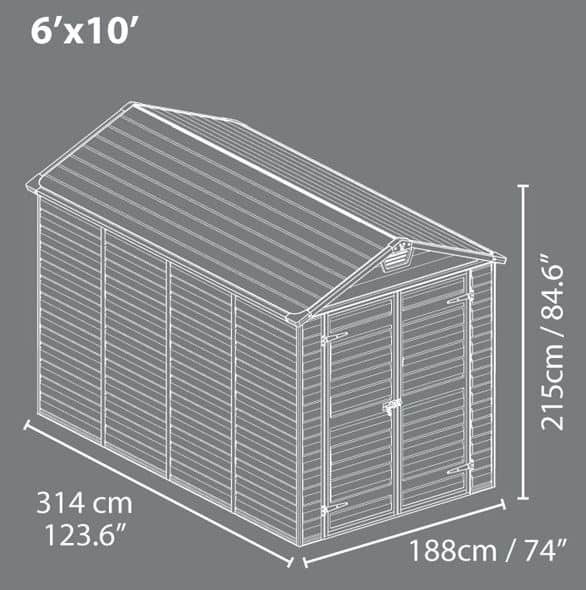 Palram make the assembly process for this shed as easy as possible for the customer. In your package will be all of the panels, roofing, frame, fixtures and fittings required for easy assembly as well as a clear set of instructions. The step-by-step guide with detailed diagrams will ensure you stay on the right track during the assembly process. It is recommended that two people work on assembly for the Skylight Shed, for both safety and practical reasons. The polycarbonate panels and frame are both on the larger side and may be awkward to manoeuvre by the individual. 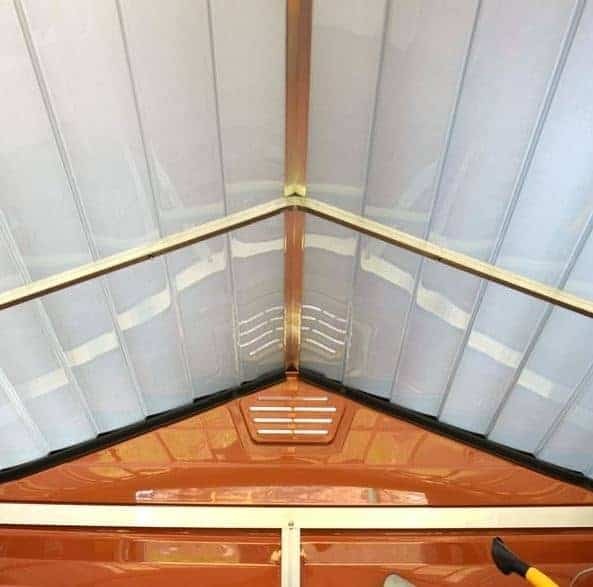 6 x 10 Palram Skylight Plastic Amber Shed: What is the overall quality like? Palram design and manufacture a varied range of high quality sheds and greenhouses to accommodate every need within the garden setting. 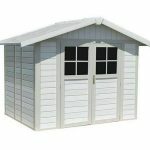 This particular model, the Skylight shed, is an excellent example of how plastic sheds are leading the way in the style stakes, with both an attractive design and practical construction. 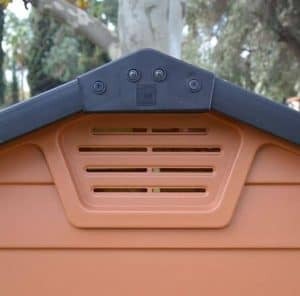 Completely maintenance free, the shed will not rot or rust and the colour will not fade or peel due to the UV resistance of the plastic. The polycarbonate panels are water and weather resistant, protecting your items against the elements all year round. The air vents and skylight allow fresh air and light to circulate and fill the interior, making a welcoming and healthy environment in which to store your equipment. 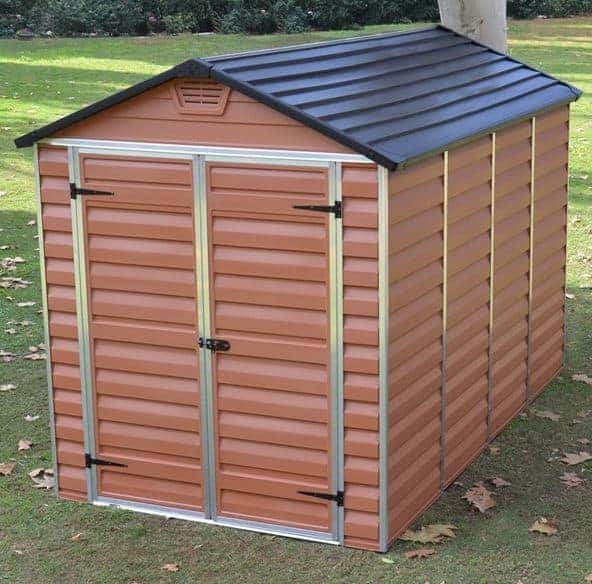 The 6 x 10 Palram Skylight Plastic Amber Shed is a very attractive, medium-sized garden shed that provides a storage solution that is both durable and will protect your equipment from the elements. The 10-year anti-rust guarantee will give you the peace of mind that your shed will look great and be performing well in many years to come. 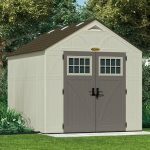 At this mid-range price, the Skylight Shed has much to offer the average household looking for an easy storage solution. These are overall a good idea and perfect for a zero maintenance garden but I can’t help thinking that we have been guinea pigs to some extent and are doing somebody’s job for them. It seems they have been released in a “beta” version with some design faults, some of which are pretty basic. 2. The roof bar needs an awful lot of silicone applied in order to prevent leakage and we thought some kind of joint sleeve should be supplied. They have now sent out a “fix” that is impossible to fit without breaking your neck and also needs free access to both sides which we don’t have. 3. The screws are all mixed up in one big bag and yet they are numbered in the instructions. In which case they should be packed in numbered packets to ensure the right ones are used and not leave it to guesswork. The only way to help with identification is to spend ages sorting them all and counting them to match with the parts list before starting, then number them yourself in order to follow the instructions. 4. There is no way to hold the doors open or hook them back so we have two good old-fashioned house bricks to stand in front of each! 5. The floor may be “non-slip” but the joins are a trip hazard and also a dirt trap as they are not fixed, just overlapped and when the shed is bolted to the ground the lip rises slightly so we have had to duck tape them for safety. A double slanted cover strip for each joint that can be fitted before screwing the side panels to the base would be a good addition. 6. The air vents allow water to pour straight in every time it rains! Having straight slots to the outside is really not very clever and there should be overlapping slanted covers outside to allow air in but not water. Something needs to be done as a fix for this as the sheds allow in far too much water and you cannot position anything on the back wall that you are not prepared to get a soaking. Covering them is not really an option and I have found some reviewers with similar issues but there needs to be some kind of mesh plate that we can fit from the inside that will allow air circulation without water ingress. 7. In general there are far too many gaps around the panels at the sides and especially around the base and if there is daylight showing then water and cold can get in. 8. The sliding latches at the top and bottom of the closed door are not very effective, in particular the one at the top which jiggles down with any movement. This not only affects security but makes it more difficult to slide the bolt across. 9. The diagram showing the roof bar assembly at the gable end (p29 small, p30 large) does not make it completely clear as to the position of the ridge bar in relation to the gable bars and on the first shed we had it wrong and didn’t realise until we tried to fit the vertical bracer bar and it wouldn’t reach the bolt at the bottom. 10. It is advertised in places as having a “free floor” but without the floor it would most certainly allow water to pass under the side panels so I would say that far from being a “free” floor it is a necessary component for construction and performance and as such part of the kit as standard. As it is packed in with the panels it is obviously meant to be inclusive so should not be singled out as a freebie. 11. There were self-tapping screws missing so I had to spend over an hour chasing around town to find some ending up the other side of the river at Toolstation. With so little daylight available that is something I could have done without. There should have been ample plus spares but there weren’t. 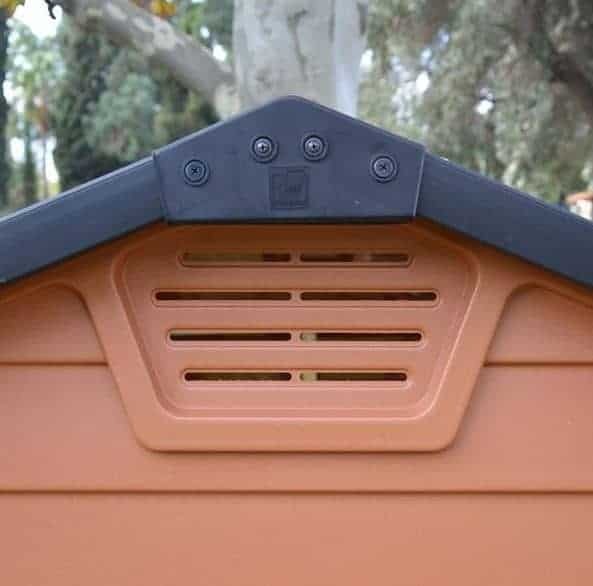 Thanks for taking the time to do such an extensive review of the 6 x 10 Palram Skylight Plastic Amber Shed. I am sure it will really help others in deciding if this is the right product for them. It sounds like if Palram made just a few small changes this would be a real winner for you.